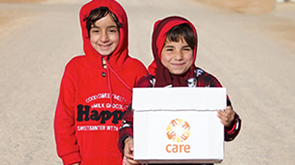 Feel inspired by CARE’s work? Inspire the people around you! Why not get together – whether it is with friends, a book group, women’s institute, Girl Guiding group, sports club, or any other community group – to raise awareness, have fun, and raise vital funds for CARE’s life-saving work around the world? It’s always motivating to support and fundraise together in a group. A great way to do this is by signing up your group to take part in Walk In Her Shoes – you will all be walking 10k steps a day for a week in solidarity with women and girls who walk miles each day to collect clean water. To sign up, please register each member of your group individually here and we’ll help you get your fundraising started. Get creative – we’re here to help! Please get in touch to get your community group involved.